Hike Rating: Moderate. Lots of up, but only a modest steepness. Trail Condition: Unknown. It was covered with 3 inches of snow. Portions of the trail appeared to have a considerable cant, perhaps from erosion. Starting Point: Thomas Divide trailhead three miles southeast of Newfound Gap on Hwy 441. Trail Traffic: We were the only ones on the trail. Perhaps snow related. How to Get There: From Oconaluftee Visitor Center near Cherokee, NC take Hwy 441 (Newfound Gap Road) northwest. Go 10 miles or more, past the left hand hairpin turn, then 0.4 mile past the overlook marked History Exhibit. The trailhead is on the left in a right hand hairpin turn with a long, narrow parking area. As we were driving up Newfound Gap Road, upon reaching about 3,500 feet, there was more and more snow piled alongside. Uh-oh. I guess it did snow here a few nights ago. Suddenly the thought came to my head that our chosen trail might be snow covered. Gee. Did I bring everything I need to hike in snow? I do have ice traction, but don’t have gaiters. I do have dry socks if needed. What else? As we continued climbing higher, so did the snow. When we arrived at Thomas Divide trailhead it was definitely covered. Looked like about three inches, maybe a little more. Ken went a hundred yards out the trail to scout conditions while I changed into my boots. Upon returning he reported that it looked about the same further into the trail. Now it was decision time. Did we want to hike in snow today? We probably won’t be able to go as far. Or, do we drive back down lower and try a different trail? In the end we decided to go for it. After all, we are Meanderthals and what’s a little snow anyway? Our original plan was to go to Newton Bald, about 5.5 miles away. That would be really tough trudging through snow. So we backed off our goal. We said lets go to the Kanati Fork junction and see how we’re doing. That is 1.8 miles away. So with that as a goal, off we plunged on the Thomas Divide. 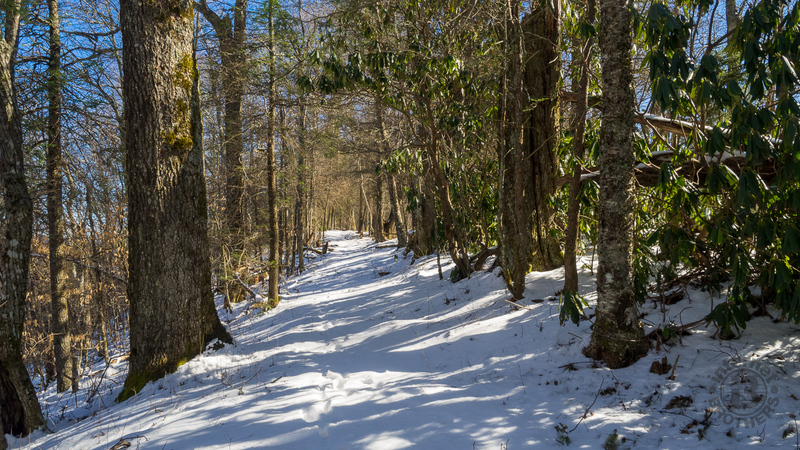 Thomas Divide Trail was built by the Civilian Conservation Corps stationed at the Deep Creek Campground as a means of connecting Deep Creek with the heart of the Smokies. Both the ridge and the trail were named for William Holland Thomas, an intriguing friend of the Qualla Cherokee who did not leave on the ill-fated “Trail of Tears” forced relocation to Oklahoma. Although a white man, Thomas was adopted by Chief Yonaguska and became chief himself after Yonaguska’s death in 1839. His concerted efforts enabled this Eastern Band of Cherokee to remain in North Carolina. The first few hundred yards descend gradually southward, then the trail makes a sweeping right turn and begins climbing to the crest of Thomas Ridge. It is uphill the rest of the way to Nettle Creek Bald. At the curve in the trail it switched to the north side of Thomas Ridge, meaning the snow was even deeper now… at least four inches, sometimes as much as six. After about a mile from the trailhead we reached the crest and an outstanding view across the valley at Clingmans Dome Road, and then at the tower-topped Dome itself. There aren’t any unobstructed overlooks per se, so this view would not be available during green season when the trees are full. Speaking a trees, this is a delightful forest. It is filled with mountain, red, and sugar maple. So imagine the magnificent color in October. You will also find yellow birch, beech, and Eastern hemlock. Somehow the adelgid blight hasn’t found all these hemlocks yet. Acorns left on the trail were also an indication of the presence of oaks… some quite large. As we proceeded along Thomas Ridge we also encountered rhododendron thickets, spruce and fir. Perhaps the most interesting though are the trees that are no longer standing. There are quite a number of massive chestnut stumps and logs lying on the ground alongside the trail. The tannic acid in their bark makes the American chestnut hardier and more weather resistant, even after death. Because of this durability, the chestnut was usually the log of choice for those settlers locating in the Smokies in the 19th century. The snow was fatiguing. Combine the climb with post-holing and each step was more strenuous than normal. The trail was also canted, partly for drainage, but I think there’s some erosion going on. The trail seems to be slipping down the hillside. This put a strain on my right hip. I know. Whine. Whine. Whine. We definitely weren’t doing 10 miles round trip on this day. Seasonal trail reports indicate Thomas Divide is a nice place for spring wildflowers including spring beauties, bergamot, fire pink, and the aforementioned rhododendron. Doddler is noticeable in summer and the delightful Turk’s cap lily blooms later toward autumn. 1.8 miles up the trail you reach the junction with Kanati Fork Trail, a very steep descent to Newfound Gap Road. It’s out in the middle of the forest, no landmarks highlight your arrival there. The only notice is the trail sign. Stay right here to remain on the Thomas Divide Trail. Ken and I pulled out the map for another decision. Did we want to continue, or turn back? It looked to only be another three-quarters mile to the summit of Nettle Creek Bald. That became our new goal, and a place to stop for lunch. Throughout the length of this hike we were following deer tracks. Probably not the same one, but there were always tracks in the snow. No boots though. We were the first humans here since the last snowfall. Occasionally we would see paw prints of coyote too, and even some that looked feline. As we continued above Kanati Fork, the forest changed somewhat. There were more oaks and maple, even some juneberry. What was most noticeable was the size. These were mostly saplings. Nettle Creek Bald, as well as Newton Bald farther ahead, had once been cleared by settlers. Unlike the natural balds found in other regions of the Smokies, these were maintained by farmers. Once the land became national park in the 1930s, the summits were allowed to regrow forest. The original names still remain however. Look too for a different variety of wildflowers along this stretch of trail. You are likely to see blooms with odd names like wood betony, Indian cucumber, trailing arbutus, spiderwort, and one of my favorites — flame azalea. About two-and-a-half miles from the trailhead we reached to summit of Nettle Creek Bald. This is the highest point on the trail. We stopped for lunch and turned around here, but if you continue, the next couple miles descends about 500 feet. We scrambled just off the trail about 50 feet to the razor edge of the ridge and found a snow-less spot to sit. The north side here is almost straight down. Not a cliff, but extremely steep terrain where it would not be a good idea to fall. The trees struggle to stay upright. Oconaluftee River and Newfound Gap Road are in the valley below, and Richland Mountain is across the way. The breeze was freshening from the south as we munched our sandwiches, blowing in warmer air. The warmer air began the melting. As we put everything away and headed back, the snow was already softer… not as crusty. As we descended lower some of it was completely gone already. There were even bare, snowless areas on the trail, unlike a mere hour before. The return trip seemingly took only about half as long. OK, let’s summarize this Thomas Divide hike. We planned to go a lot farther, but unexpected snow made that difficult. Still, we thoroughly enjoyed ourselves and the snow obviously enhanced the scenes. I would like to do this one again, especially in spring when the wildflowers rock the trail, and in fall when the oaks and maples display their brilliant hues. This is a forest hike. There really is no destination, other than connections with other trails. This is one to simply enjoy the wonderful Smokies woods. When last we hiked on Thomas Divide, there was unexpected snow. Still wanting to see more of this obscure trail, I paid a visit… this time earlier in the season. Also, planning to go farther this time, I set my sights on the junction with Sunkota Ridge Trail 4.6 miles out into the backcountry. The weather couldn’t have been more cooperative. It was a beautiful, clear October morning when I made a couple requisite stops at Hwy 441 overlooks for pictures. The air temp was in the high forties (warmed to high 60s by the time I was done) with just a hint of breeze. It was one of those Smokies azure sky days that enable views for miles and miles. I won’t repeat the first part of the hike, but I made it to our previous turnaround point in less than 90 minutes. From there it was all new territory for me. The trail was lined with bottle gentian and lowries blue aster, and the occasional patch of goldenrod. Some of the leaves were down and brown, but most of the forest was still green. I had been hoping for more color, but not to be. Still too early. Not far beyond where we stopped last time, at the 2.5 mile mark, the trail begins a descent to Tuskee Gap. This is a gradual, mile-long descent of approximately 400 feet to the gap. Along the way, the Divide trail narrows considerably and kind of hangs on the ridge. It appears to be somewhat eroding down the hillside. At Tuskee Gap you traverse through a rhododendron and laurel canopy that dominates the greenery. There is some blow down in the area, presumably from the remnants of Hurricane Irma. I expect the Park Service to be out taking care of that very soon. On this day I encountered a pack train and one ranger, the only other beings I saw (well, except for the dozens of chipmunks that were scurrying about busy doing their chipmunk things). The ranger said they were out pulling root balls off the Kanati Fork Trail. From Tuskee Gap it’s another mile to the junction with Sunkota Ridge Trail, with a 200 feet ascent followed by a 100 feet descent. There is nothing remarkable about the junction. 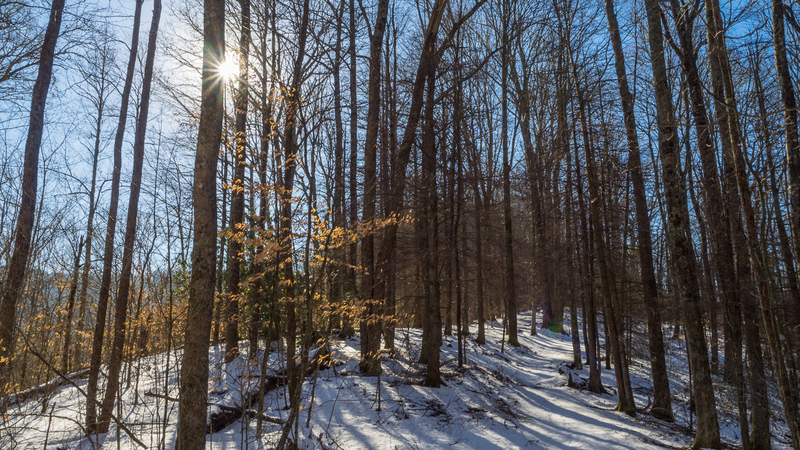 It is simply a meeting of trails in the heart of the backcountry forest. However, there are any number of options here for continuing a much longer hike. For me though, the 9.2 miles round trip was plenty for a day hike. Sunkota Ridge Trail continues into the heart of the Smokies, becoming the long distance Benton MacKaye Trail and heading to Martins Gap five miles to the west. If you stay on Thomas Divide Trail it will take you to Newton Bald Trail just 0.4 mile away. It is then 5.5 miles to where Newton Bald Trail spills out very near the Oconaluftee Visitor Center. I might consider that as a shuttle hike with Ken sometime in the future. Of course you can also continue on Thomas Divide Trail to its terminus at Deep Creek near Bryson City, still nearly 10 miles away. Below is an updated GPS track of this hike on Thomas Divide Trail, as well as an additional photo gallery of my new adventure. As always, please feel free to leave your comments below the gallery. Thanks for visiting! Pack train at Kanati Fork Jct. Trail sign at Sunkota Ridge Jct.